U.S. Cannabis Spot Index down 1.1% to $1,091 per pound. The simple average (non-volume weighted) price decreased by $32 to $1,224 per pound, with 68% of transactions (one standard deviation) in the $480 to $1,968 per pound range. The average deal size decreased 6.8% to 4.1 pounds from 4.4 pounds last week. In grams, the Spot price was $2.40, and the simple average price was $2.70. 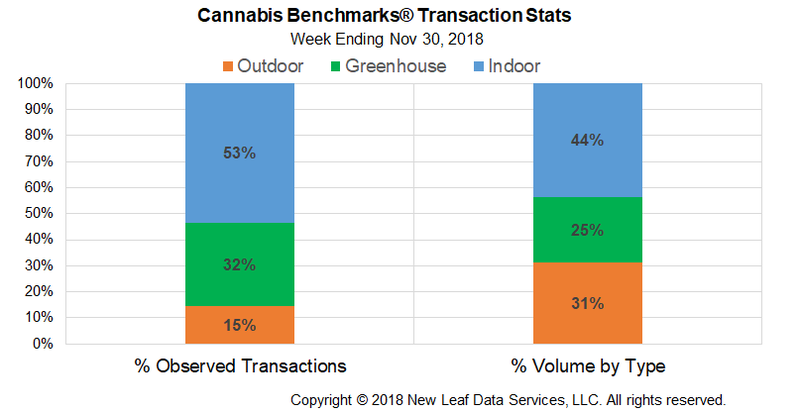 The relative frequency of trades for greenhouse flower increased this week, by less than 2%, while that for deals involving indoor product contracted by the same proportion and the relative frequency of transactions for outdoor flower was flat. Greenhouse product’s share of the total reported weight moved was stable week-over-week. Meanwhile, the relative volume of warehouse flower grew by 1% compared to last week, while that for outdoor product decreased by the same proportion. The U.S. Spot Index declined by 1.1% this week to settle at $1,091 per pound. This despite three of the four major Western markets – Colorado, Oregon, and Washington State – seeing increases in their composite prices. However, the total volume of trading reported in Oregon was smaller than usual, lessening the influence of that state’s Spot Index on the national average. The U.S. Spot averaged $1,075 per pound for November, virtually identical, but down marginally, compared to October’s monthly mean price of $1,076 per pound. In 2017, the national composite rates’s monthly average ticked downward by 0.6% from October to November, from $1,421 to $1,412 per pound. The trend line of the U.S. Spot Index continued its upward momentum this week, but its rate of increase was tempered slightly by the decline in the national weekly volume-weighted average. The Trailing 4-Week Average of Colorado’s composite price is now displaying clear positive movement after very a very modest upturn last week. 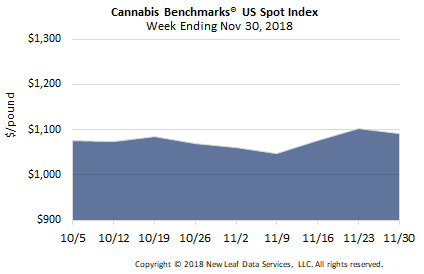 Despite significant regulatory uncertainty, the trend line of Michigan’s Spot Index continues to sink gradually, behavior that commenced in mid-October. The downward trend in wholesale prices in Michigan may be due to a significant reduction in wholesale buyers, which we note in the Forward Curve commentary. 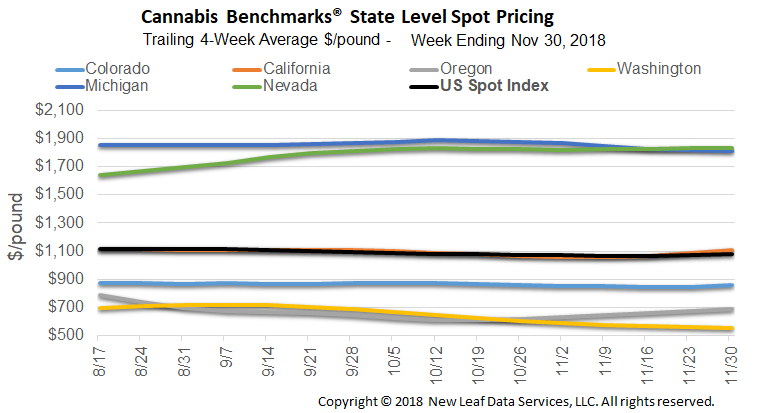 While outdoor growing is permitted under Nevada’s rules, such product has not been reported as part of the state’s supply mix at this time and the Trailing 4-Week Average of the Silver State’s Spot Index has climbed upward through this month. 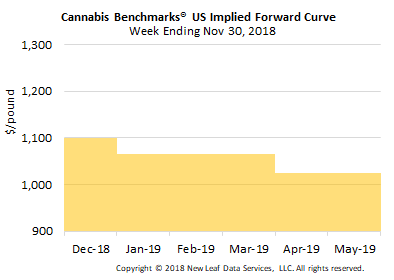 December 2018 Forward closes up $25 to $1,100 per pound. The average reported forward deal declined nominally to 56.5 pounds. The proportion of forward deals for outdoor, greenhouse, and indoor-grown flower was 54%, 30%, and 16% of forward arrangements, respectively. The average forward deal size for monthly delivery for outdoor, greenhouse, and indoor-grown flower was 67.5 pounds, 44 pounds, and 43 pounds, respectively. At $1,100 per pound, the December Forward represents a premium of 0.8% relative to the current U.S. Spot Price of $1,091 per pound. The premium or discount for each Forward price, relative to the U.S. Spot Index, is illustrated in the table below.